MARNUS Labuschagne grew up idolising South African cricket legend Jacques Kallis and didn't speak a lick of English until he arrived in Australia as a 10-year-old. But Queensland's latest Test bolter has no doubts about where his heart lies now as he chases a baggy green alongside four Bulls teammates. "My allegiance solely lies with Australia, there's no doubt about that," Labuschagne said. "The boys give me plenty of stick, but I'm very excited to have the opportunity to play for Australia." Labuschagne was one of five Queensland Bulls to depart Brisbane on Wednesday night bound for Dubai ahead of Australia's two-match series against Pakistan. And he is not the only Queenslander to have ties to another nation. Test incumbents Matt Renshaw (England) and Usman Khawaja (Pakistan) along with uncapped all-rounder Michael Neser (South Africa) were also born abroad but now call Queensland home. Toowoomba-bred fast bowler Brendan Doggett is the only one of the five Queenslanders to hail from Australia. The ball tampering suspensions to Test captain Steve Smith, vice-captain David Warner and Cameron Bancroft opened the door for a new wave, and Labuschagne did enough to earn a spot in new coach Justin Langer's 15-man squad. Like Neser and Doggett, Labuschagne is considered an outside chance of making his Test debut against Pakistan, but he is ready to make the most of any opportunity after Queensland was rewarded for last summer's Sheffield Shield triumph. "I'm on the tour because I want to play," he said. "We had a lot of fun last year. Most of us would say that's one of the best years we've ever had playing cricket in terms of enjoying the game. "We're all a very tight bunch in Queensland. It was great what we did last year and hopefully we can transfer that at the next level. "Anyone that's been following Shield cricket knows the guys that have been picked like Neser and Doggett have been awesome and deserve their chance. "Everyone thoroughly deserves their opportunity." Labuschagne, a gritty batting all-rounder, attended an Afrikaans-speaking school in South Africa as a child before his family immigrated to Australia. "Dad (Andre) worked for a mining company in South Africa and they branched out into Australia," Labuschagne said. "I went to an Afrikaans school until grade three and when I came here I went straight into grade five. "I had barely enough English to get around the playground to socialise. In terms of learning English in class, I did it from scratch. "The younger I was the better I transitioned, but it was still very difficult in terms of starting to learn a whole new language at the age of 10. "It was tough but I've done all right now." What didn't change throughout Labuschagne's travels was his love of cricket. The 24-year-old reckons he first picked up a bat at two and a professional career beckoned when he started to dominate as a teenager, catching the eye of Bulls scouts. 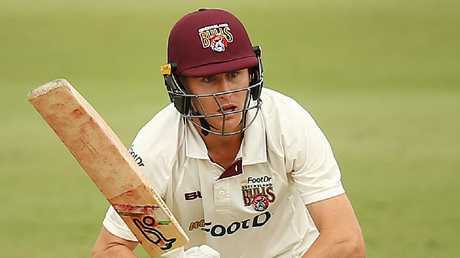 Labuschagne was last summer's second highest run-scorer in the Sheffield Shield, posting 795 runs at 40 as Queensland won the title. 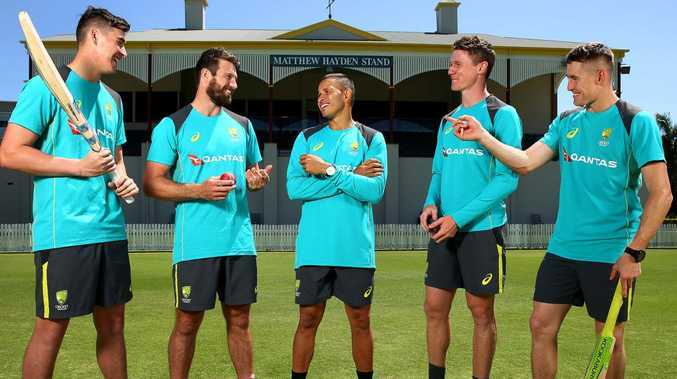 Doggett, capable of bowling 150km/h thunderbolts, has been picked as pace spearhead Mitchell Starc's understudy, while Neser's consistent form with bat and ball earned him a spot in the squad. Renshaw and Khawaja are expected to be named in the top order for the first Test beginning October 7.